Simple oil change... NOT !!! I have a HiSun HS700 (686cc one cyl.) and needed to do it's first oil change. 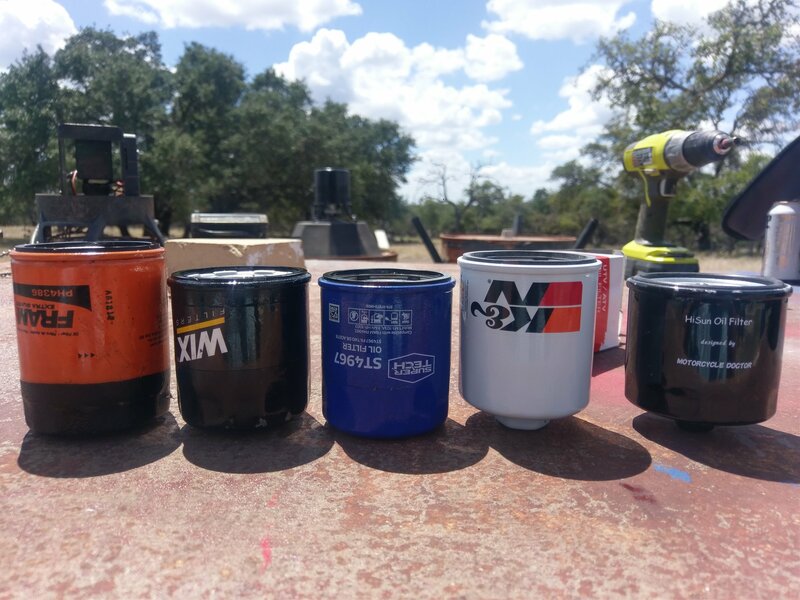 I found that the Chinese oil filter CF188-011300 had a Fram cross-reference to a PH4967 so I picked the Fram filter up at Walmart along with the recommended 10W40 motor oil. I removed the oil fill plug and then the drain plug, followed by removal of the original factory oil filter. The oil drain plug and original filter were extremely tight. I did not have the 67mm oil filter wrench and bent the filter up pretty badly using channel lock pliers. Replaced the drain plug, and the filter and the fill plug after putting in the required 70 ounces of oil and started it up. I shut it down almost immediately but not until a little over a quart of oil squirted out from the oil filter's rubber seal. Yes, I had lubed the new filter gasket and made sure the old filter gasket was not left behind when I removed the old filter. I went to the store and bought the oil filter wrench and removed the Fram filter. I saw nothing wrong with the seating area or the gasket so I put it back on (making sure it was as tight as I dare without stripping it) and added the missing oil. I stood on the side of the motor where I could see the filter while I started the engine again. Again the oil started to squirt out. I removed the Fram filter and reinstalled the bent original and topped off the oil again. I started the engine and it is not leaking now. Anyone have this issue? Is the Fram filter a true replacement? Did I just get a new filter with a bad gasket which is not visibly bad? Hi there, I have had this happen to me once on my Mule several years back with a Fram filter. I then put a Wix filter on it, and it did not leak. Not saying this is your case, just a possibility. Thank you Travis, I will order one of the WIX filters when I find the right one for my UTV. Would you please post a pointer to the cross-reference chart you are using? In the mean time I have ordered a "CFMOTO" CF188-011300 on line to see if that works. Late yesterday afternoon I received the CFMOTO CF188-011300 that I had ordered and I put a paper towel under the old filter, removed it, cleaned the seating area and put a light coat of oil on the new CFMOTO filter gasket and installed it. The gasket is very different from the FRAM. A side view of the FRAM gasket would look like a small hard (firm) square. A side view of the Chinese filter would look like a wider soft oval. Since the CFMOTO is not easily available locally for me, I downloaded the cross-reference list than Vaughn provided for future reference. It would be interesting to have a list of filters that are common to fail for this application. I would add the FRAM PH4967 to that list. Sadly, the FRAM PH4967 is listed on the cross-reference that Vaughn provided (no negativity to Vaughn intended). I'm sure the PH4967 is also on some other cross-reference list because I got that number from somewhere. Alright! Glad you got it figured out! Just a follow-up note. 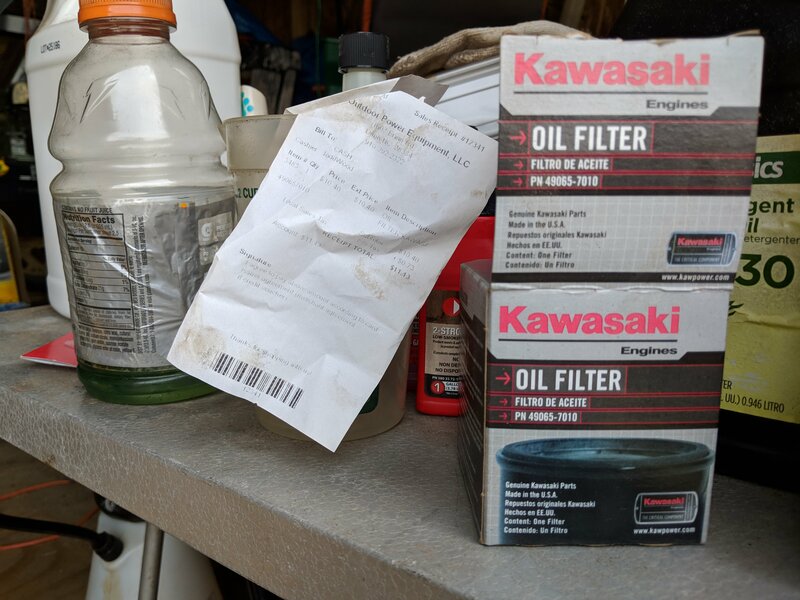 I looked through the cross-reference oil filter list provided by Vaughn and the other provided by Travis and noticed that they both list the Kawasaki 49065-7010. I park my UTV in my garage and I park my Zero turn mower in the shed. 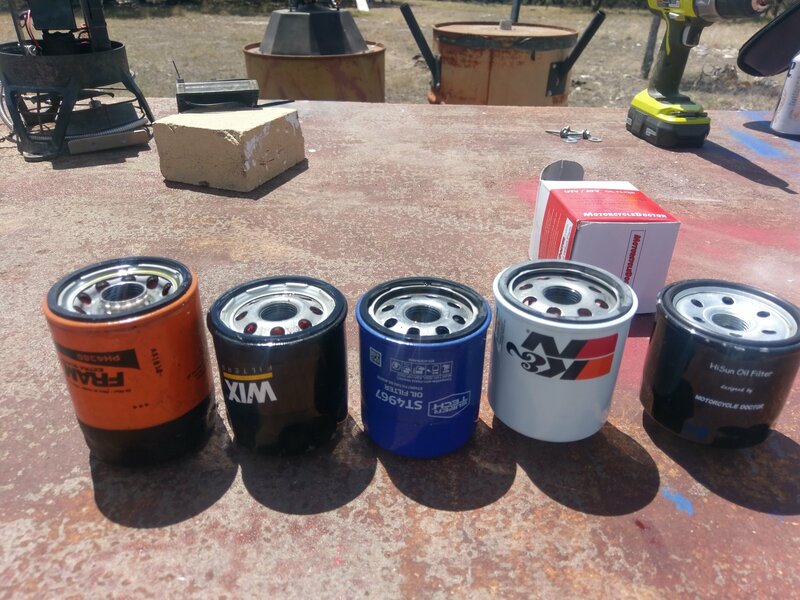 I have not tried the filter on the UTV yet but the Kawasaki engine on my lawn mower uses the Kawasaki 49065-7010 and I have a new spare for the mower in the shed. If I had noticed this in the beginning (if I had these cross-reference listings), I more than likely would not have run into my problem. I will try the Kawasaki filter the next time I change the filter on the UTV and it will be my "go to" filter for both machines. Have a Missimo 400utv. I have tried wix, fram and supertech from the list referenced above and all have leaked when the engine is running. Juat fyi. Hi @Kannon09 Also be sure the old gasket came off too. You might try the CF moto filter BigRich used, assuming it's the same engine. I ordered a HiSun and a K&N hp-1003. Will post if one or the other works. Thanks. Not only let us know if it works but how much it cost too if you don't mind. Please post a picture of the gasket side of the filter you are getting. I noticed a significant difference between my original and the one that failed. The one that worked was very much like the original. Others have posted that they used the brand/type that I had fail so I may have had o defective one. I could not see what made it (the FRAM) leak severely, but it did. 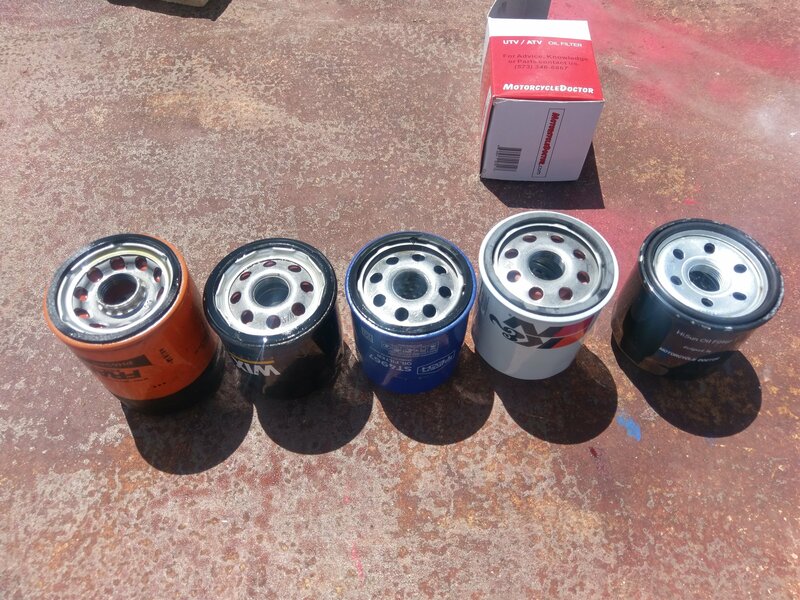 So the Hisun Oil filter was the only one that worked. It had a much rounder gasket than any of the others. The supertech leaked the least but still leaked under pressure. The Hisun pictured above was $8.00 plus $7.75 shipping off of Amazon. Hope this is helpful to someone. The UTV is a 2015 Massimo 400. I do believe the "CFMOTO" CF188-011300﻿ I used successfuly looks identical to the "HiSun" in your pictures Kannon09. It was only $7.99 and shipping was free if you want to give that one a try. By the way, I believe the engine block is the same for the 400, 500, & 700 UTV's.